BioCision, LLC and Brooks Automation have launched CryoPod™ Carrier, a jointly developed liquid nitrogen (LN2)-based system for the safe, reliable and protected handling and transport of cryogenic biospecimens. The portable, data-logging carrier was unveiled today at the annual meeting of the International Society for Biological and Environmental Repositories (ISBER) in Phoenix, Arizona. The result of a 12-month joint development project, the patent-pending CryoPod Carrier is a breakthrough technology that enables more than 4 hours of < -150C temperature stability for cryogenically frozen biospecimens and therapeutics, keeping them well below glass transition (Tg) temperature where biological activity may cease. Researchers and clinicians often rely on improvised methods to handle and transport frozen biospecimens and therapies such as placing samples on dry ice, which is considerably warmer at temperature of -78C, handling heavy LN2 dry shippers that must be transported on a cart or dolly, or handling unabsorbed LN2 in open containers that present a safety issue. These methods can be hazardous for the operator, and often introduce temperature fluctuations that could impact the integrity of a frozen specimen or the efficacy of a valuable therapeutic. The CryoPod Carrier provides a safe, portable, and trackable solution for hand-carrying temperature-sensitive cryogenically frozen biological materials through the use of a special material that holds and minimizes LN2 movement and prevents LN2 from coming in contact with the samples. The instrument displays temperature, date and time, and features audible and visual alarms, as well as logging capabilities. The carrier can integrate with an automated filling station, ensuring hands free, safer handling, and replenishing the LN2 charge in less than 15 minutes. With the emergence of cell therapy and other live therapeutics, as well as the rapid global growth of biobanks and repositories, CryoPod technology addresses a critical gap in the cold chain of custody and aids in minimizing temperature fluctuations for frozen specimens, preserving biosample integrity. 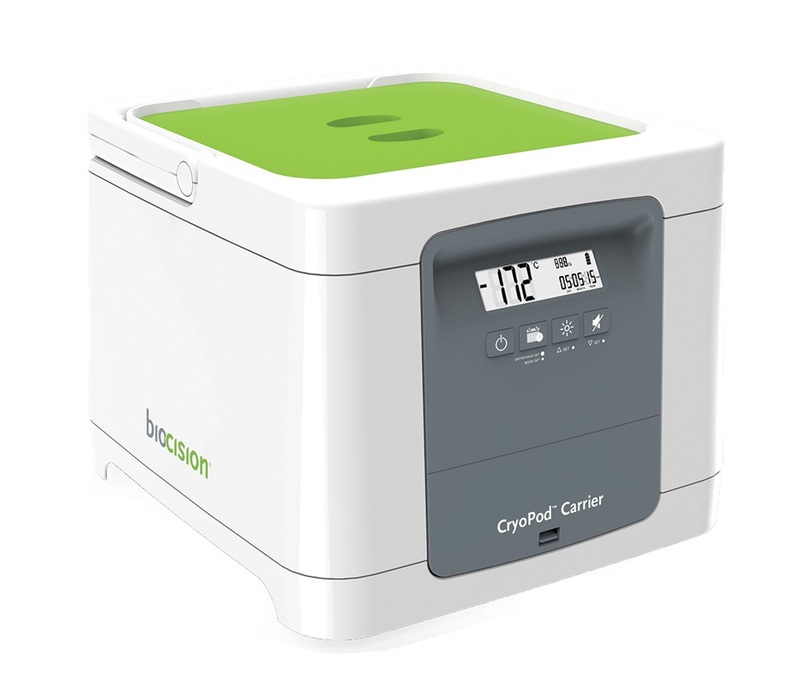 The CryoPod Carrier is a lightweight, compact LN2-based carrier weighing less than 20 pounds. The handle enables easy one-hand carrying for transporting samples between labs and buildings, or around metro areas. Both Brooks and BioCision will sell the CryoPod Carrier directly and through established distribution channels when it is available later this year. BioCision and Brooks are exhibiting at the 2015 ISBER annual meeting May 6 - 8, 2015 in Phoenix, AZ. BioCision is exhibiting in booths 519 and 521, and Brooks in booths 313 and 412.